Gluten is an ingredient of wheat and some other grains, but it also appears in a surprising range of other products. If you need to live gluten-free, or prefer to exclude it from your diet, this quiz may help you understand the role of gluten in modern life and how better to manage your gluten free lifestyle. A. Coeliac Disease is a what kind of condition? B. Which of these could cause coeliac disease to fail to be revealed in a diagnostic test? 2. Lack of sugar consumed before the test. 4. Lack of gluten consumed before the test. 1. A network which traps bubbles of carbon dioxide, causing the dough to swell or rise. 2. A crispy crust by becoming hard when it is exposed to hot air. 3. Bread which doesn’t go green so fast by inhibiting the action of mould organisms. 4. Bread which slices easily. D. Which of the following may contain gluten? 1. Some tinned soups, crisps and beer. 2. Whisky and some lipsticks. 3. Chip shop chips and postage stamps. 1. Excluding wheat entirely from the diet. 2. Excluding gluten and lactose from the diet. 3. Excluding gluten entirely from the diet. 4. Taking steroids and supplements. A. Coeliac disease is in fact an autoimmune and allergic condition as well as a nutritional one, so all the answers are true. B. The correct answer is 4. The standard test for coeliac disease, or gluten intolerance, requires the consumption of gluten to demonstrate the anti-endomysial antibody is present. When it is discovered in the blood, the patient is then likely to have a gluten intolerance and will be send for an endoscopy. However, if the patient has already removed gluten in part or whole, from their diet, the anti-endomysial antibody may not appear in the bloodstream and first level diagnosis may fail. C. The answer is 1 – gluten acts to trap carbon dioxide given off by the chemical reactions between sugar and yeast. In gluten free breads, this action is often replaced by the chemical expansion of baking powder. D. The correct answer is 4. Some soups and crisps, many beers and lagers, many whiskies, some lipsticks and most chip shop chips contain gluten. Chips from a chip shop are often fried in the same oil as battered fish, so they pick up the gluten from the batter. Lick and stick stamps often contain gluten, as do some envelopes lick strips. E. Answer 2 is right. The Roman for adhesive or ‘glue-like’ has given us the term gluten, as it has the term glutinous. F. Answer 3 is correct. 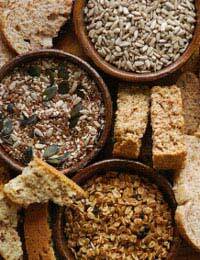 Gluten is found in many other foods than wheat, so excluding wheat alone is not sufficient. Some coeliac disease sufferers are also lactose intolerant but nobody should exclude lactose until complete diagnosis confirms the intolerance. Steroids may be prescribed, as may supplements, but they are not sufficient to form a treatment, they simply help ameliorate the symptoms of gluten-intolerance, particularly in the first weeks and months of diagnosis.